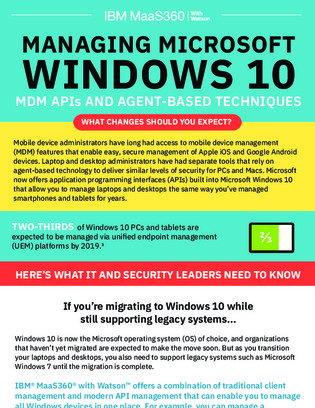 Many organizations are already making the move to Windows 10, but for others this migration is still looming. Regardless of where you are in the migration process, when the time comes you’ll need a plan for transitioning your laptops and desktops, but you’ll also need to support legacy systems until the migration is complete. Download this white paper for insights into how IBM MaaS360 can provide your organization with a combination of traditional client management and modern API management that enables the unified management of all Windows devices.